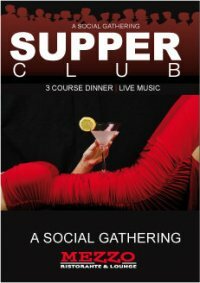 Join Mezzo Ristorante & Lounge on April 29, 2011 for their first monthly Supper Club of 2011. A fabulous dinner has been planned by Chef Michael Barlozzari and a DJ will be here playing great music all night long. Tickets are $40 per person and dinner reservations begin at 7:30pm. If you can’t make it for dinner, meet some friends for a fabulous Mezzo martini as Mezzo turns “club” at 9:00pm. Call Filip today for reservations at 519.252.4055 or email him at info@mezzo.ca. As always, each Supper Club highlights a local charity to benefit from this event. For April, the Distress Centre of Windsor-Essex County will be the chosen charity.